WELL OVER A HUNDRED PEOPLE were in attendance Wednesday night as the third annual Block Institute Art Expo opened with an artists’ reception. Brooklyn artist DAVID PIERCE spoke about the importance of art and the Brooklyn community, and visitors browsed a juried art exhibit and silent art auction of donated pieces. The exhibition, which will remain open to the public today and tomorrow from 10 a.m. to 1 p.m., features the work of children and adult members of the Block Institute community. Block Institute, in Bensonhurst, is dedicated to improving the quality of life for the developmentally disabled and their families, and provides a range of services including special education, residential and Medicaid coordination and a nationally recognized nutrition program. Inviting the community to view the work of this little-exposed body of artists is important to Block Institute’s goal of enabling each person to achieve as much independence and integration as possible. 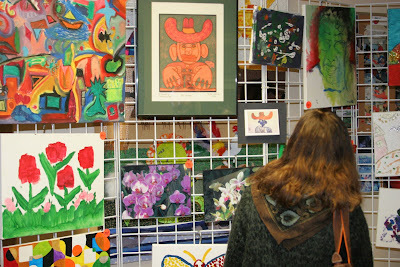 The Education Program includes art in its curricula, such as workshops in photography, crafts and painting. 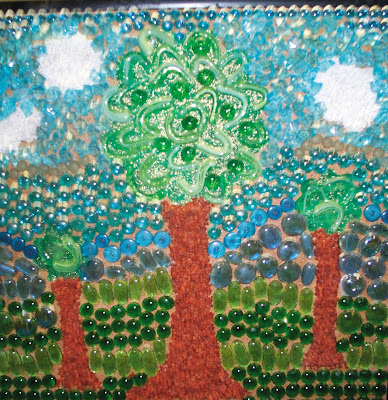 The “Trash to Treasure” program uses recycled materials to create art in various media. Adult student DEAN MILLIEN has been recognized by several NYS Rehabilitation Association Art Contests and his work has been exhibited in two New York galleries. Another student, JORGE PEREZ, was awarded third place in the 2008 Haym Salomon Art Awards. David Pierce’s work — ink drawings, oil, acrylic and watercolor paintings and video and installation work — has been shown in galleries around the world, mainly in Chicago and New York. He studied at the School of Art Institute of Chicago and Pratt Institute. Until recently, Pierce updated his blog, david-pierce.blogspot.com, about the fictional pursuit of his real persona DJ Mayonnaise Hands for the office of president. Block Institute is located at 376 Bay 44th St. AUTHOR ANN REINLEIN, using a pen name in tribute to her mother, has written a whimsical book, The Adventures of Mister Squirrel Acorn, about the character’s journey through college (the “University of Hard Nuts”) and family life. Reinlein is currently enrolled in the Institute for Retirees in Pursuit of Education program (I.R.P.E.) at Brooklyn College. Mister Squirrel Acorn is her first published book; she lives in Brooklyn with her husband, Jimmy, and their dog, Clawdia. BROOKLYN COLLEGE HAS EARNED a coveted spot on the U.S. President’s Higher Education Community Service Honor Roll for its volunteer service efforts in Brooklyn communities. This Honor Roll is the highest federal recognition a school can achieve for its commitment to service learning and civic engagement. For ten years, Brooklyn College has acknowledged significant service provided by student volunteers through its volunteer service registry, SERVA (Students Engaged in Responsible Volunteer Action). Students in this year-round program in 2007 and 2008 documented 8,318 hours assisting local communities. ADVANCED PURCHASE TICKETS are available for the Miss Brooklyn Scholarship Program from $25 to 40 by visiting www.BrooklynQueens.org. The event will be held on Sunday, Feb. 22, at the Kumble Theater for the Performing Arts, Long Island University, Brooklyn Campus.